Wayne State University Press, 9780814345146, 200pp. The Burden, edited by award-winning Detroit newspaper columnist Rochelle Riley, is a powerful collection of essays that create a chorus of evidence that the burden is real. As Nikole Hannah-Jones states in the book's foreword, "despite the fact that black Americans remain at the bottom of every indicator of well-being in this country-from wealth, to poverty, to health, to infant mortality, to graduation rates, to incarceration-we want to pretend that this current reality has nothing to do with the racial caste system that was legally enforced for most of the time the United States of America has existed." 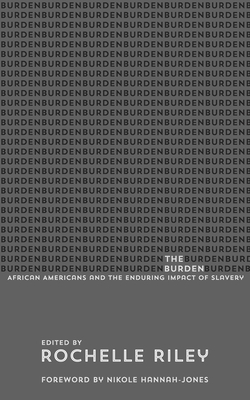 The Burden expresses the voices of other well-known Americans, such as actor/director Tim Reid who compares slavery to a cancer diagnosis, former Detroit News columnist Betty DeRamus who recounts the discrimination she encountered as a young black Detroiter in the south, and the actress Aisha Hinds who explains how slavery robbed an entire race of value and self-worth. This collection of essays is a response to the false idea that slavery wasn't so bad and something we should all just "get over." Rochelle Riley is an award-winning newspaper columnist who is no longer seeking permission to put the burden down. She has fearlessly called out elected officials who should have been ashamed of themselves and has helped raise millions of dollars for just causes, especially the fight for improved adult literacy. She offers commentary on MSNBC and NPR and contributes to Essence and Ebony magazines. She was inducted into the Michigan Journalism Hall of Fame in 2016, received the 2017 Ida B. Wells Award from the National Association of Black Journalists and Northwestern University, and was awarded the 2017 Eugene C. Pulliam Fellowship by the Society of Professional Journalists. She also is a global wanderer who has visited twenty-six countries and counting.